Richard Zarkin, Public Relations Manager for the Riviera Nayarit CVB with Diane Bolt, Editorial Director for WestJet Magazine and Sara Samson, Senior Editor. Twenty-one journalists from top media in Toronto, Calgary, and Vancouver got a closer look at Mexico’s Pacific Treasure thanks to the Riviera Nayarit CVB’s Public Relations office. 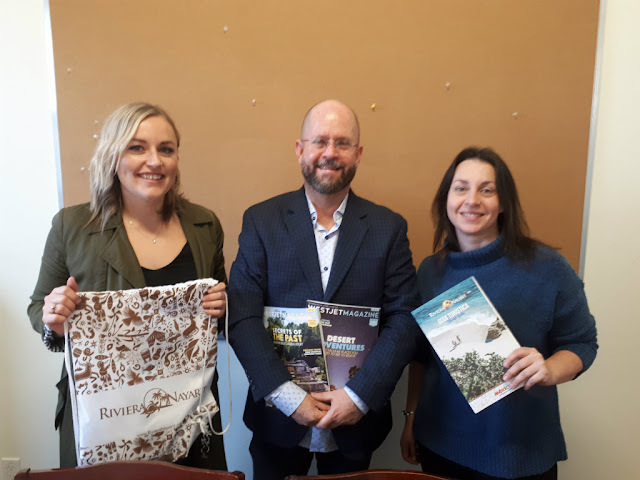 The Riviera Nayarit Convention and Visitors Bureau carried out a Media Tour in Canada’s most important cities to continue strengthening ties with media from the top countries of origin for tourists to the region. The tour took place from November 19th to the 23rd and was led by Richard Zarkin, Public Relations Manager for the CVB, as a continuation of the promotional work he began last August when he interviewed with 31 journalists in the United States. According to Zarkin, the idea behind this “face-to-face” with media representatives is to get to know them better and hear their concerns, while at the same time sharing positive news. “The contact is personal during this type of activity and it’s much easier to attain our goals for ROI, promotion, and brand positioning,” he added. This time around Zarkin interviewed with 21 different media in Toronto, Calgary, and Vancouver, home to top names including the Toronto Star—the biggest daily in Canada with a circulation of 219,552—, and Travelweek, aimed at Canadian travel professionals and agencies with a circulation of 18,187. Among the standouts was a meeting with Amy Bielby, editor at Today’s Bride, the biggest bridal magazine in Canada with a circulation of more than 100,000 magazines. Bielby is also editor of Destination Wedding and its online version. In Calgary, Zarkin with Diane Bolt, editor of WestJet Magazine with a circulation of 46,000 magazines. They offer information on North American travel and destinations to WestJet passengers. + The Globe and Mail Travel Editor Domini Clark. Circulation: 316,020. + Suresh Doss, print editor for Foodism Toronto and Escapism Toronto. Circulation: 50,000. + Randy Sharman, host of the Informed Traveler radio show. Potential audience: 50,000 listeners. + Noa Nicol, editor-in-chief of VITA magazine. Circulation: 17,112. + Whitney Millar, editorial assistant of NUVO Magazine, created for well-educated general interest readers who travel and are intellectually curious. Circulation: 150,000. + Jennifer Hubbert, online editor for Explore Magazine. Circulation: 25,000. + Bianca Bujan, assistant editor for WestCoast Families Magazine and writer and editor for the Bits of Bee blog. + Sandra Thomas, special sections editor for the Vancouver Courier, a standard-sized weekly for residents of Vancouver, British Colombia. Circulation: 106,392. + Lise Boullard, general editor, founder, and blogger for The Editor’s Diary. Celeste Moure, writer for The New York Times, Condé Nast, Vogue, and Huffington Post. Michelle Hopkins, contributor to BC Living, Vancouver, Courier, and 1989 Magazine. Alison Kent, food editor for Best Health and Clean Eating magazines. Lara Ceroni, travel and lifestyle editor for ELLE Canadá, The Globe and Mail, and Canadian Living. Caleigh Alleyne, travel editor for Travel & Design, Country Living, Daily Hive, and others. Bert Archer, editor for the National Post and The Globe and Mail. Carol Patterson, wildlife explorer who writes for Fodor’s Travel, BBC Travel, Roads & Kingdoms, The Globe and Mail, and Avenue, among others; and Vanessa Pinniger, editor and travel writer for The Vancouver Sun, The Province, and Edmonton Journal. Of note: an article has already been published in the Travel Week News as a result of the tour: http://www.travelweek.ca/news/raising-hotel-rates-not-an-issue-riviera-nayarit-going-after-luxury-clients/ and an important return on investment is expected from the different media that were contacted. Riviera Nayarit reaffirms its status as a first-class tourist development, an example of the growing and successful tourism industry in Mexico. The destination works intensely to attain its goal of attracting more and better tourism to Mexico’s Pacific Treasure with the support of the Government of the State of Nayarit via the Tourism Promotion Trust (Fiprotur).